Venice has a wealth of fine art and antiques to offer collectors. From centuries old collections of prints to contemporary mosaic sculptures of gigantic proportions. Those with specific items in mind can also find brokers and dealers who specialize in locating rare and unique objects. 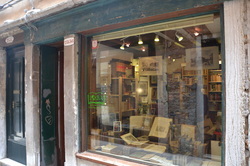 These shops are a few of the great variety of fine art and antique bookstores in Venice. 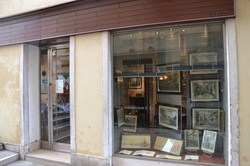 Giorgio Mastinu Fine Art, Calle Botteghe, San Marco, near Campo Santo Stefano. 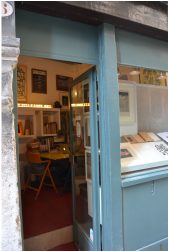 This gallery has a small but wonderful selection of antique books and prints and modern art. The owner, Giorgio Mastinu is a collector, museum curator and music historian. An all around amazing source of information about the art scene in Venice! Giorgio is also friendly and helpful with his knowledge; renowned among visitors as the living definition of Venetian charm. Visit Giorgio before considering collecting just about any type of art in Venezia. Linea D'Acqua Libreria Antiquaria, San Marco, Calle Della Mandola. Linea D'Acqua has a well curated selection of antique books and prints and an extremely knowledgeable staff who can both explain the history and process behind each piece in the shop and use each piece to explain the history reflected within it. Chiara Gizzi gave me a substantial amount of her time in describing the building of Venezia using a map from the 1800s as a visual aid. It was one of the most enjoyable visits I've had to a shop in Venezia, and should be definitely a first-choice stop for serious collectors. You can learn more on their website. Segni Nel Tempo di Federico Bucci, Dorsoduro, Calle Longa San Barnaba. 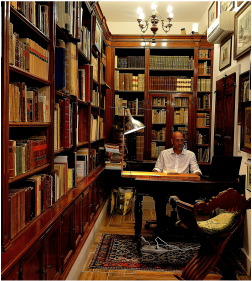 This antique and vintage bookshop in Dorsoduro houses a truly amazing selection of antique books and serves not only collectors interested in Venetian history, but any and all antique book buffs. I spent quite some time here admiring an amazing piece from the 1930's that showed the entire Canale Grande (from each side) in continuous images that could be entirely folded out to stretch about five meters. This is a book-buyers certified establishment; A certification that guarantees the authenticity of the antique pieces sold. See more of what they have to offer on their website. Libreria Emiliana, 2941 San Polo, Near Campo Dei Frari. Libreria Emiliana was said to be the oldest bookstore in Venice, and though they have changed locations, their selection and attentive service remain excellent. Here I've discovered books, paintings, prints and maps from the 17 and 1800's, and many other amazing antique books about Venice. The dealers here can pull out a wonderful selection to suit any and every query I've ever arrived with and also will help you to source copies of some out-of-print materials. A wonderful place to visit that may leave you in even greater awe of all the treasures there are to discover in Venezia! You can find them online here.